St. Petersburg, St. Pete as the locals call it, has an average of 360 days of sunshine a year and is home to over 200,000 people. It is serviced by several major highways making it the perfect place for effective advertising and billboards. Billboards on Interstate 275, Interstate 175 or Interstate 375 would yield high exposure of your business. 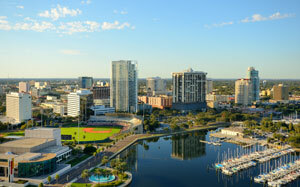 Having the sun shine all year makes St. Pete a very popular retirement location. This has led to an affluent atmosphere where local advertisers can target this audience with appropriate out-of-home advertisements. The St. Petersburg Pier is just one of the many tourist attractions that draws thousands of visitors a year, and is another example of the advertising opportunity St. Pete has to offer.